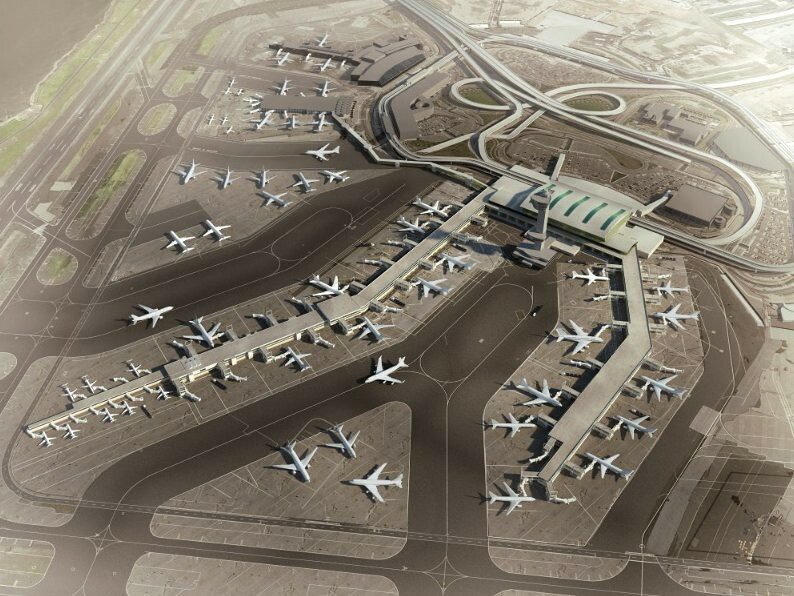 If this rendering of Terminal 4 at JFK looks familiar, good. That means you’re reading, as it, or something very much like it, was in our story last week about the Port Authority and Delta’s plans for expanding the terminal. What is different, though, if you look closely, is the number of gates. This rendering was released by Delta last week, though it initially confounded us because the talk had been of nine new gates, not the 30 we counted when we compared it to the terminal’s current layout, which you can see and compare after the jump. It turns out, the wrong rendering had been released, and this is in fact the ultimate plans for the future development of Terminal 4, with 10 new gates on Concourse A (right) and 11 more added to Delta’s nine on Concourse B (left). That makes for a total of 46 gates—larger than some mid-sized airports—up from a current 16. No wonder they have to tear down Terminal 3 to make room for more plane parking. But not before Hal Hayes has something to say about it. Terminal 4 today, with 16 gates. Hayes was the lead planner at SOM when it created the current Terminal 4 a decade-and-a-half ago, and then he filled a similar role at HOK when it developed a prior plan for Delta at JFK. Now on his own, the architect takes issue with the preservationists we spoke to last week—to his mind, Terminal 3 is easily the most important of all at JFK, even compared to Saarinen’s Terminal 5, which he said is formally but not functionally groundbreaking. As for the threatened Terminal 6 by I.M. Pei, Hayes said Terminal 3 is “superior to Pei, especially in terms of aviation architecture. Pei’s is a pretty corporate box, but it could be anywhere.” Terminal 3, however, had an unparalleled design that allowed for passenger loading and maintenance to take place all under its unique canopy. “This is really the place that established the paradigm for airport architecture, and these terminals were treated like international headquarters, intended to be corporate icons,” Hayes said of JFK. Terminal 4 in 2015, after Delta has added nine new gates and Terminal 3 has been torn down to make way for parking and taxiways. Hayes said the biggest problem is that Terminal 3 “suffers from a no-name architect,” otherwise it might have a better shot at preservation—something he insists would be far easier than the Port Authority, Delta, or even some preservationists will allow. He proposes demolishing the ’70s addition, running the connector Delta is planning between terminals 2 and 4 through the old Terminal 3, and turning it into a grand mall of some sort, with the shops and eateries that are now familiar to any airport. As for the Port Authority’s insistence that there is no room for even remnants of the building, Hayes disagrees. “They can leave it pretty much where it is and not impact the new terminals or the parking one iota,” Hayes said. He should know, as this is precisely what his previous plans called for. UPDATE: It was just announced that AECOM has won the $11 million contract to oversee construction on the terminal project. Is there anything they can do?